India's teas are world famous; its coffees on the other hand are less well known, so it may surprise you to learn that India is the sixth largest coffee-producing nation in the world, producing a variety of both wet and dry processed coffees, including the Monsooned coffee grown on the Malabar Coast. Furthermore, it was an Indian holy man by the name of Baba Budan who played a pivotal role in globalizing the cultivation of coffee some four hundred years ago. In approximately 1600 A.D., Baba Budan first tasted coffee when he was in Mecca performing the Hajj. So enchanted was he with the 'wondrous' beverage that he wished to procure a plant so that he could continue his enjoyment when he returned home. He found, however, that the coffee trade was tightly controlled by the Arabs who ensured that beans were parched to prevent germination prior to being sold. Undaunted, he smuggled seven fertile seeds out of the Arabian peninsula which he planted upon his return home to the Chandragiri Hills of India. A century later, in 1696, the Dutch bought seedlings, offspring of Baba Budan's smuggled treasure, on the Malabar Coast of India which they took to Java where they established the first commercial coffee plantings outside of the Arabian Peninsula. In 1711, the first wedge in breaking the Arabian coffee cartel was placed when coffee from the Dutch East Indian colony of Java was offered for sale at public auction in Amsterdam. Today, the Chandragiri Hills are known as the Baba Budan Hills and coffee cultivation is widespread in the southern half of the Western Ghats -- the mountain range which spans 1,000 miles from just north of Mumbai (Bombay) all the way to the southern tip of the subcontinent, paralleling India's Arabian Sea coastline. The coffee is grown under high-canopy shade alongside spices such as cardamom and black pepper, which may later be hinted at in the cup. 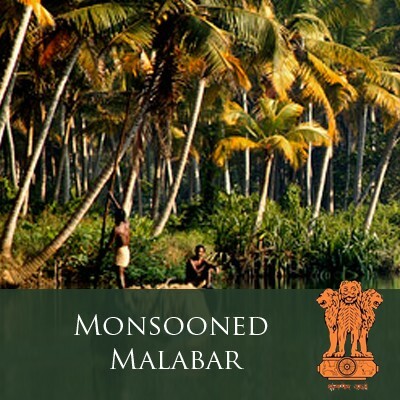 Read more in our newsletter: December 2011 - Why is it called Monsooned Malabar?